On a typical Tuesday morning, Darlene Kumler packs inspirational stones into her jacket pockets and heads off to visit patients and families with her Chaplaincy partner, Don Meyer. Darlene became a chaplaincy services volunteer around November of 2016. An active member of Sterling United Methodist Church, she was recruited by fellow church member and On-Call Chaplain Don Meyer and by Pastora Marcela, the minister for the Spanish speaking ministry at the church. Darlene speaks Spanish; she lived in Mexico for several years. Even though Darlene’s first thought when asked was “no thanks,” Don and Pastora Marcela kept inviting her. They knew that she had the gifts and graces for ministry with the sick. 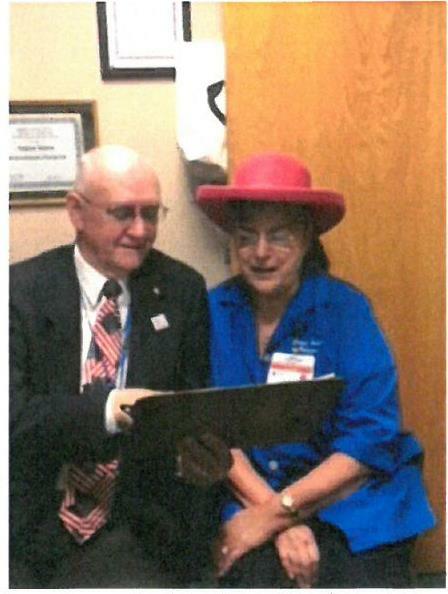 After a while, “the time just felt right,” and she became a chaplaincy service volunteer, mentored by Don along the way. And what about her hats? She said, “I always liked hats and a found one in the gift shop. I decided to wear it on the floor visiting patients. They seemed to like it. It allows patients who wish to chat to have something to chat about.” Darlene dresses her hats with the seasons. She also handouts holiday stickers to patients and staff. She began handing out little heart stickers on her first Valentine’s day here. She passed out over 50! As Darlene visits with patients and their families, she listens to their struggles and their stories. She’s learned something about herself in her service here. She says, “God has always been with me, I know that. But I realize it more so now that I am visiting with others, praying with others.” Darlene doesn’t miss a beat when asked if there is anything she would like to add to our ministry here. She replies with her gracious humor, “A nap when I am done!” God bless you Darlene and thank you for sharing your gifts and graces here!